Stuffable Angry Birds Characters at Limited Build-a-Bear Workshops! Let’s admit it, we’ve all played hours and hours of Angry Birds on various phones, tablets and computers. Ok, now that you’ve admitted it, let’s all admit that it’d be super-cool to get some Legos and Lincoln Logs to build some of the levels and play Angry Birds for real… Thanks to BABV and Rovio, you can! babvcrazy from our Bearville Insider Forum found an online ad for stuffable Angry Birds characters that you can now buy at local Build-a-Bear Workshops! Not all BABW’s will be carrying the awesome new plushes, but check out BABW’s ad to see if your local Build-a-Bear Workshop is one of the limited locations. We’d love to see some of you building real-life puzzles with the birds and pigs, so please send us some pictures if you do! Free Waterbottle Available at the Sportsplex! Make sure to stop by the Sportsplex today to pick up your free waterbottle! Click on the Panda to receive your prize. 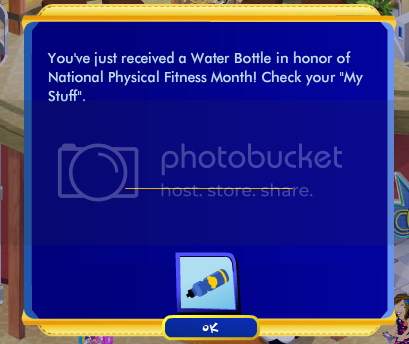 These are being given away in honor of National Physical Fitness Month and thanks to member AliceGemini29 for letting us know about it! New Coin Flip Game Available at the Bank! Thank you to member karenbearhug for letting us know about a brand new game in Bearville today! Head on over to the Bank and check out the new Coin Flip game. The objective is to sort the coins as they move across different levers. Along the way you can also earn bonus points for answering financial questions correctly! Abbie Bright is back today April 19th! Another Chance for the Rainbow Ride! [img_assist|nid=1217|title=|desc=|link=node|align=left|width=550|height=332]Thank you to member Mickeyquack from our Bearville Forum for making us aware that Abbie Bright is now back in Bearville as of today (April 19th!). This gives you another opportunity to earn the Rainbow Ride. The sign can be found in two locations….the Bearywood Mall and the entrance. Good luck! Chim Chim Cheree, Float Fashionably! Check out the unbelievable umbrella you can get from Bearville Outfitters! Now you can float freely from rooftop to rooftop like Mary Poppins, and Laurenblue50, who let us know about this cool new item! Like other rides, it costs 5 BVO credits. Thanks to member tweety for letting us know the March VIB gift has been released. It is an interactive volcano experiment, which should excite the science lovers out there. It’s Official! 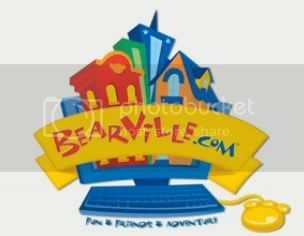 Bearville.com has Arrived! As many of you have already noticed, the new Bearville.com is now officially up and running. Members are reporting some new features appearing in Bearville as well. Be sure to check out the new “Be A Stylist” game! You have clients to work on and get to practice your styling skills. March has been announced as Nutrition Month. If you click the banner in Town Center it will bring you to the City Garden to visit the new City Garden Mini Market. Items for sale at the cart include new Water Lily seeds as well as the formerly rare Golden Cherry and Maple Seeds! There is a new Four Leaf Clover quest available from the bear in the Neighborhood in preparation for St. Patty’s Day. Make sure to stop by! These are just a few of the new items available in Bearville. Stay tuned to BI for more breaking details! New Bearville.com Coming March 1st! Thank you to bellasummer207 for alerting us to other tidbits located on the Build A Bear Workshop Facebook page. Included is a quote from BABW that says “We will keep all the same stuff you know and love. Now it’s called Bearville.com and we’ll have even more cool stuff!” There will be a new homepage and three (yes, three) brand new shows. Stay tuned to Bearville Insider for details after the launch on March 1st! Upcoming Easter Promotions from Build a Bear Workshop! Thanks to forum member babvcrazy for sharing the latest USA Beary Newsworthy information on Easter with us! From March 18 – April 24, you will receive a FREE Easter Basket with a $20 purchase (while supplies last). In addition, starting March 18, you will be able to make your own Easter Basket from the upcoming movie “HOP” in theaters April 1st. Making a “HOP” basket will earn you a cool new skateboard ride. Check out the photo below! If you haven’t already noticed, the highly anticipated new CyBearZone is now available in Bearville! Thank you to tweety for pointing out many of the cool features and providing us with screenshots. Looks like lots of great information there! Here are a few of the cool new screens, which have been organized well to store all of your Bearville information.